Earlier this year the Financial Accounting Standards Board (FASB) issued a new leasing standard that becomes effective for public companies in calendar year 2019 and nonpublic companies in calendar year 2020. That’s a long way off. Why worry about it now? Do your debt agreements have covenants? If so, the calculations may be negatively impacted by recording all long-term leases (defined as leases of more than one year) on the balance sheet, which is required under the new leasing standard. The standard applies to all leases, including real estate, so any business with an office lease is potentially impacted. In case you are saying “what new leasing standard?” we will provide a brief background. The new standard requires that all leases be recorded on the balance sheet at the present value of the monthly payments over the remaining lease term, resulting initially in an asset and liability of the same amount. The asset is a “Right to use asset” and the liability is a “Lease liability”. Basically, you are recording an obligation for future lease payments akin to a debt obligation on a fixed asset. Since you don’t own this asset, you record a right to use asset which is depreciated like other depreciable assets. In regards to the debt covenants many debt agreements have them. The long-term debt you have now and enter into in the next several years very well may still be on your balance sheet in 2020 when this standard becomes effective. If you have financial covenants in your long-term debt agreements, implementing the standard may impact those calculations and cause you to violate the covenants. Covenant violations result in default of the debt agreement and give the lender the legal right to terminate the debt agreement and demand immediate repayment of the entire loan. While lenders will frequently provide written waivers for covenant violations, this is not without cost as lenders will usually require a waiver fee be paid. Plus, covenant violations could damage your relationship with your lender. However, there are ways the covenants in future agreements can be worded (or current agreements amended), that can eliminate or minimize the impact of the new standard. 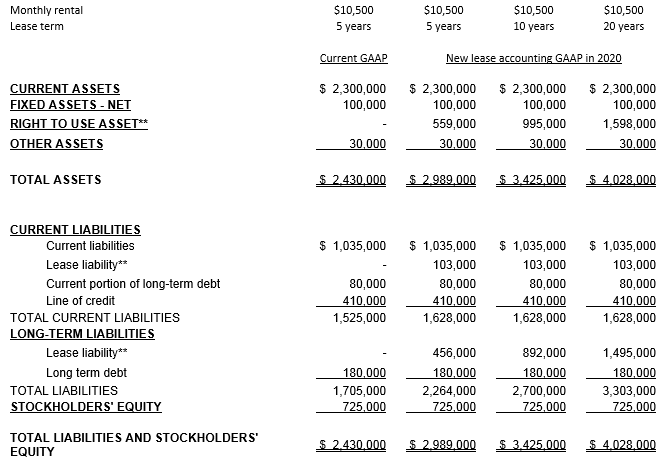 To illustrate the impact of the new standard, we have included an example balance sheet below. The company is a highly leveraged with a 5 year lease. We have included the impacts of a 5, 10 and 20 year lease as the longer the lease, the greater the impact. An otherwise healthy company with little debt may violate covenants if their lease terms are extremely long. The company has a $10,500 per month lease. The lease payments will be recorded on the balance sheet at present value when applying generally accepted accounting principles (GAAP). After recording the lease on the balance sheet, you can see the debt to equity and potentially the tangible net worth ratios move in more unfavorable ranges. • Negotiate for debt covenants to be calculated with “frozen GAAP”. “Frozen GAAP” clauses protect companies from changes in accounting standards and would allow the covenants to be calculated as they are at the date of the debt agreement. • Include a clause excluding the operating lease liabilities from the definition of liabilities in the borrowing agreement. • Indicate that “Right to use assets” are not included in the definition of intangible assets. Absent defining this item now, the bank may define it as they see fit when the standard becomes effective. Keep the above considerations in mind when negotiating and renegotiating debt in the next several years. When the time comes, you’ll be thankful you were ultra-proactive with respect to this item in the new standards. Claudia Wolter, a Shareholder with KatzAbosch, joined the firm in 1988. She has played a major role in leading the firm into the 21st century with cutting edge initiatives, including the transition to and managing of a paperless environment. She serves as Co-Chair of the firm’s Accounting and Auditing Services Group, assists in the quality control management and oversight of the firm and is a member of the Construction and Real Estate Services Group. Most recently, Claudia served as a contributing author of “Construction Accounting,” an in-depth guide to construction financial and accounting issues for attorneys distributed by the American Bar Association. A dedicated professional, Claudia holds the prestigious distinction of Certified Construction Industry Financial Professional (CCIFP), a certification held by less than 50 professionals in Maryland and less than 1000 professionals in the United States, the designation of Certified Construction Auditor (CCA) from the National Association of Construction Auditors (NACA) and a Lean Six Sigma CPA Green Belt certification from Ohio State University ATI and Boomer Consulting, Inc.
About KatzAbosch: Founded in 1969, KatzAbosch is one of the largest CPA and business consulting services in the Mid-Atlantic region. As an accounting firm, our mission is to provide the highest quality accounting, tax, financial and management consulting services to our regional clients. We understand the needs and challenges of our clients and we have made it our obligation to create, grow and protect asset value. KatzAbosch is consistently named a Best Accounting Firm to Work For in Accounting Today and has been named a Top 200 Accounting Firms in the Nation by Inside Public Accounting. Our firm is also ranked among the Top 15 Largest Accounting Firms in the Baltimore Area by the Baltimore Business Journal and a Top Workplace four times by The Baltimore Sun.